roasted sweet potato salad | omfg. so good. Well, would you look at that. My favorite holiday is right around the corner. Time to dust off the roasting pan and sift through a barrage of sweet potato recipes to find something just a wee bit different to sidecar the ol’ bird. Look no further, friends. Roasted Sweet Potato Salad. This recipe was actually inspired by a side dish at one of our favorite local restaurants, Liberty Market. 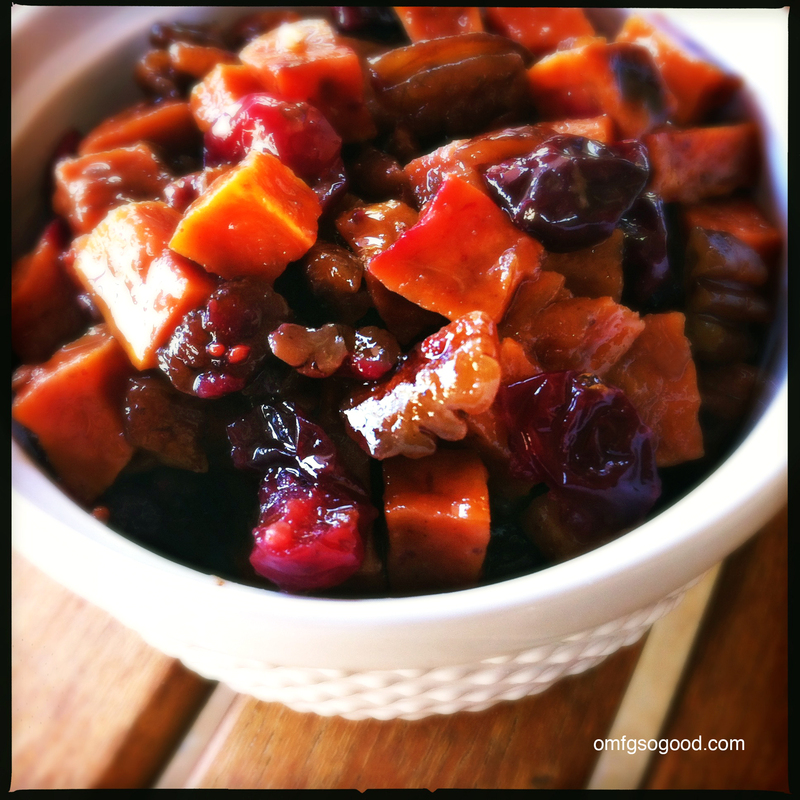 Their version is a cold sweet potato salad with dried cranberries and pecans, tossed with a bit of olive oil, salt and pepper. 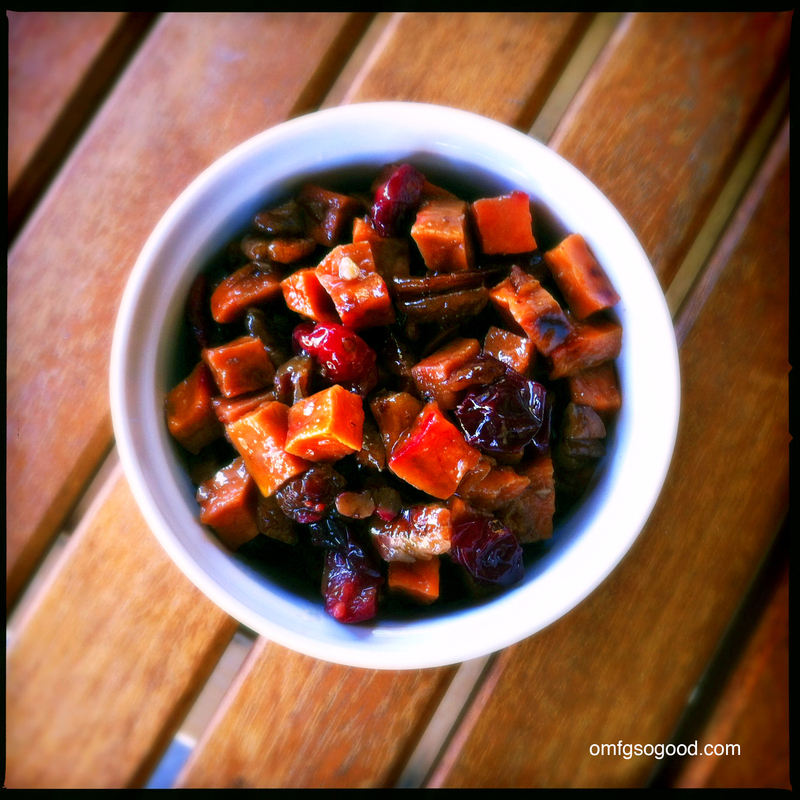 I opted for roasting the diced sweet potatoes with fresh cranberries and pecans, sprinkled with a pinch of cayenne, salt and brown sugar. The smell was… ah-ma-zing. The finisher? Top it all off with a spicy maple dressing. Holy cannoli. Somebody stop me. Preheat oven to 375 degrees. Line a sheet pan with parchment paper and set aside. In a medium sized bowl, combine the sweet potato chunks, chopped pecans and cranberries, sprinkle with cayenne, salt and brown sugar and toss to coat then spread in a single layer on the prepared sheet pan. 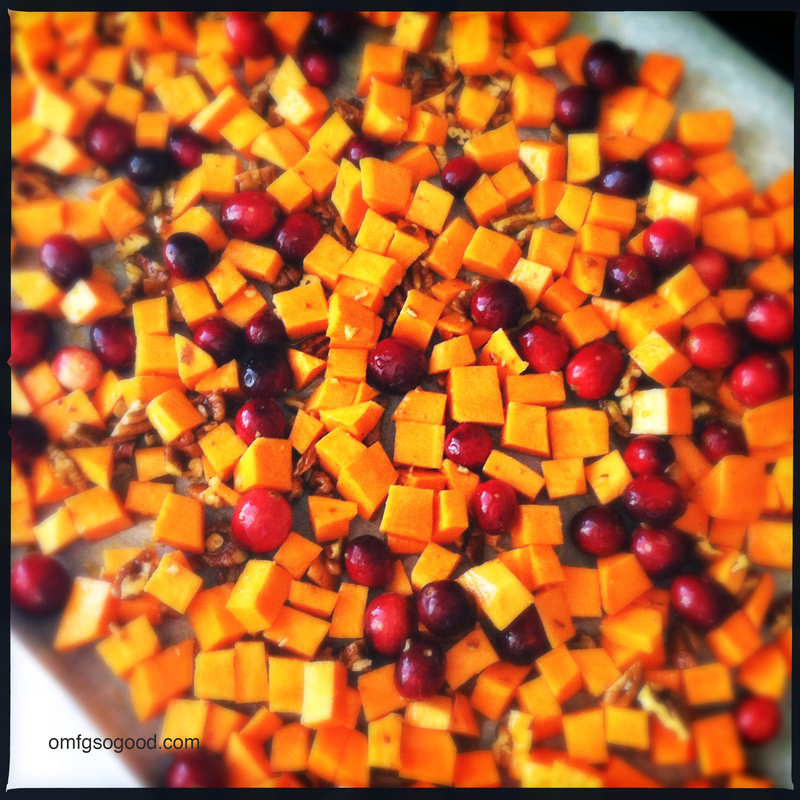 Roast in the preheated oven for 20 – 25 minutes or until the potatoes are fork tender and the cranberries have burst. Remove from the oven and scrape everything into a mixing bowl then set aside while you make the dressing. To make the dressing, combine the maple syrup, canola oil, 1/8 tsp cayenne and salt in a small bowl and whisk. Drizzle the dressing over the potato, cranberry, pecan mix and toss to coat evenly. This was phenomenal served warm, paired with Spiced Espresso Pork Tenderloin and was just as delicious the next day cold, alongside a pork sandwich. So if you’re looking to shake things up and turn some heads at the Thanksgiving spread, definitely give this a try. It’s a pretty good alternative to a classic whipped sweet potato casserole. Or, really raise a ruckus… make them both. Hell, that’s probably what I’ll do. You know I’m a sucker for roasted marshmallow topping, and indulgence just might be my middle name. Made this last night. It was very good!! Pingback: winter blondies | omfg. so good. I know this blog was posted almost 2 yrs ago; however, my 1st visit to Liberty Market was only 2 weeks ago. I live in Texas and my kids live in AZ. I absolutely agree their Roasted Sweet Potato Salad truly gets the OMFG. SO GOOD.’s highest approval rating! Thank you for posting the recipe, I’ll be making this one very soon!